In Loro Parque, June is an important month, with summer gently entering in this part of the globe. Many parrots signal the end of their breeding season, but it is also an unmistakable stimulus for many other species that love the heat and humidity. This is the case for the large macaws, which at this latitude start their first clutches and we keep an attentive eye on all births and the evolution of the parents. At this time they require stimuli such as rains, which we provide in the form of frequent misting at specific times of day, and subtle changes in the diet, interpreted by them as securing the livelihood of their future offspring. Since February, small parrots of the most varied species they have not stopped hatching, and they are all developing in a most favourable, and visible, way! In the Baby Station zone of the Animal Embassy facilities in Loro Parque, the visitors delight in seeing the growth of species very difficult to see in any zoo in the world. 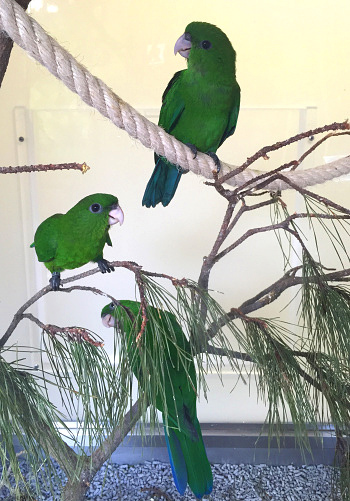 For example the Purple-bellied Parrots (Triclaria malachitacea) in the Baby Station have learned to eat alone and to interact with each other so as to develop as individuals with a strength visible even to visitors who do not know much about parrots. These delicate jewels of nature need to grow under the supervision and observation of our specialists, given that any minor carelessness could cost them their lives. The Purple-bellied Parrots are very sensitive to water quality and do not tolerate any unforeseen change. But growing up on a quality diet, and being able to develop their muscles by playing among themselves, we find future breeders who shine with their distinctive emerald green plumage, where only males display the characteristic blue-purple colour on the belly area. 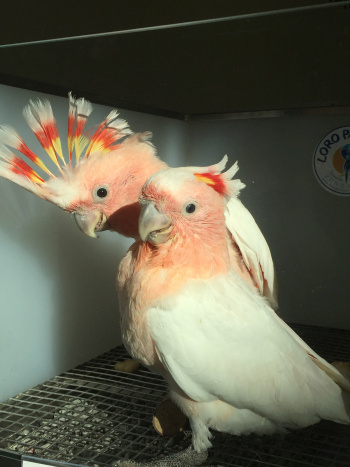 The first broods of some Major Mitchell’s Cockatoos (Cacatua leadbeateri) have also grown right before the eyes of the visitors to Loro Parque. The plumage expresses vitality and the crests are continuous surprise for those who see them. The second clutches are underway and several pairs are successfully incubating their eggs. At this stage it is very important to offer green food to the males caring for their females in the nests. Dandelion, chard, lettuce and spinach allow the parents to regurgitate the food more easily, in addition to purifying and cleansing the liver and blood system, so that they are strong and ready for the demanding task of feeding their future offspring. All cockatoos, including the ground excavators like Cacatua pastinator and Cacatua sanguinea, need these green supplements of vegetables and annual herbs to have a good growth. In fact, contact with the ground is very important to both parents and the young which are beginning to develop their phase of independence in the terrestrial environment where they seek not only food, but also entertainment and minerals beneficial for their metabolism. 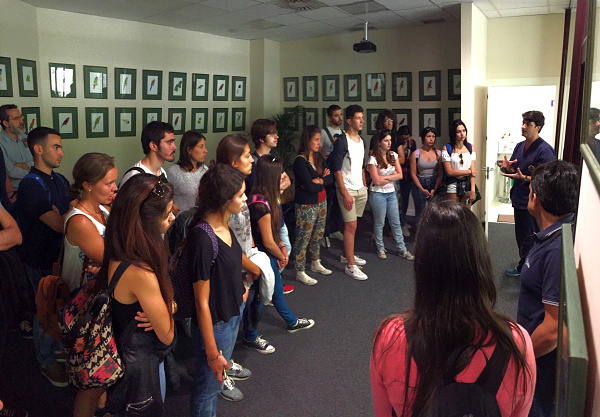 In June we had the honour of welcoming students of Veterinary Medicine from the University of Gran Canaria. They received training in different departments and talks regarding advanced animal handling. Aspects such as the careful feeding of marine mammals were shown in great detail by qualified personnel of Loro Parque. Fish quality and strict management protocols include steps that veterinarians should know for the application of preventive disease management, and to understand well the needs of the entire system. Students were able to see first-hand the operations and also had the opportunity to visit the clinical area in Animal Embassy in the good hands of our veterinary director Jorge Soares and his team. 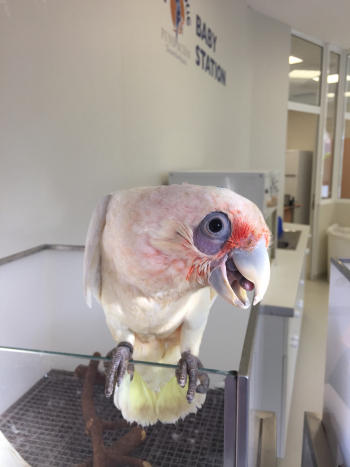 The group and their tutors were able to see and understand how to work in clinic equipped with the latest technology, and supported by a leading laboratory in the world of zoological facilities. These students were able to ask questions of all kinds, many of them as interesting and as valuable as the visit itself. This was a productive exchange for both parties, where experts and future veterinary teachers mutually benefited in favour of animals and ultimately of nature.